G was dropped off on the evening of the 9th. Almost as soon as his owners left, he started showing some jealousy and aggression issues towards Nala, which concerned us slightly but didn't seem out of the ordinary for a dog going through separation anxiety. For her part, Nala was being naughty and ignoring his signals asking her to give him space. It took us being stern with her to get her to respect his space, and within a few days they had evolved into a sibling-type relationship. They would periodically push each other's buttons and acted like they were annoyed by each other whenever we were around, but the moment we stopped looking they were all cuddly and the moment they were separated they cried like there was no tomorrow. At the end of the first week, G's behavior took a turn. He started getting into things he wasn't supposed to, ignored commands, and seemed to forget that he was once house trained. Our house turned into a litter pad and he became very needy for attention. On the days we had to leave the house, he destroyed (not destroyed, but messed up) whichever pee-resistant room he had confined him to. When we put him on the porch, he peed all over the door tracks and ripped through the screen door. When we put him in the bathroom, he went everywhere and chewed on the door frame. When I tried to sleep on the nights Michael was gone, G would wander around the house, crying and yelping incessantly until Michael returned in the morning. Sometimes we would find that he'd marked on something. Other times it was obvious that he had simply decided to release his bladder. We took him on walks, played with him, anything we could think of. G's owners happened to be in an area that didn't have very good reception, so we could only talk to them every so often and they seemed just as baffled as we were about G's behavior. Outside of G's behavioral issues, we had personal issues with some of the supplies we had been given for his care. G's owners are prong collar and e-collar users, which in and of itself isn't bad. When used appropriately, they can help in the training process for dogs. The issue comes in the havoc these items can wreck when used inappropriately. That's all I'll say on the matter. Two days before G was supposed to be picked up, he snapped at me. I had been walking with his bowl of food around a corner to place it in his normal feeding area when I heard him snarl and snap his teeth. I turned around and he was in a battle stance while Nala cowered away. When I moved to place myself between them, he turned and snapped at me. I say snapped at only because he didn't make contact with me. If I had been closer I would have been bitten. In the two weeks of us having him, this was the only instance in which he displayed the food aggression we had been warned about. When he realized he had snapped at me, he did back off and calm down (perhaps some Mama Bearing from me helped him learn his place), but I was done. Sunday could not come quick enough. Unfortunately, Sunday brought bad news. G's owners had missed their connecting flight and would not be returning until Monday afternoon. Not only did this mean my state of high stress and anxiety would continue, but we had to cancel plans because we could not leave him home alone. Monday rolled around, and we were informed that G's owners were held up long enough that their flight would not land until near midnight. Thus, we pushed back his pick-up until Tuesday morning. The plans made to replace the cancelled plans were cancelled. This morning rolled around and at the pick-up time G's owners texted and informed us that they were running a little late. This wasn't a big deal at all, but I did joke with Michael that this setback left a window of opportunity for an asteroid to strike and take out the roads from their house to ours. The conversation when they arrived was not a pleasant one. I mean, it was, but I still hated letting them know that their well behaved dog had behaved in such an ill mannered way while they were gone. I believe that all of his behavior can be chalked up to some extreme separation anxiety and may also be his way of letting off some steam about some new adjustments in his household, and his owners seemed to agree the more we told them about his behavior. At one point his owners asked whose dog they were picking up, because this dog sounded nothing like the dog they knew. They know G to be very independent and not much of a cuddle bug, while the G we knew followed at our heels everywhere. The bathroom wasn't even a safe place. Whenever we were on the couch, he would lay as close to us as possible, sometimes even laying on top of us. Now that I've had time to decompress and think the situation through, I'm not mad or frustrated any more. Dogs communicate in a different way from humans, and I believe that everything he did can be boiled down to a very extreme case of separation anxiety. G's owners want to take him in to see if he might have a UTI, which might explain his incontinence. That doesn't explain his other behaviors, though. The house has gone through a deep clean and I'm back to melting wax again. I didn't even realize I'd taken a break until I saw the warmers sitting at my Wax Battle Station, collecting dust. I guess stress does that to you. 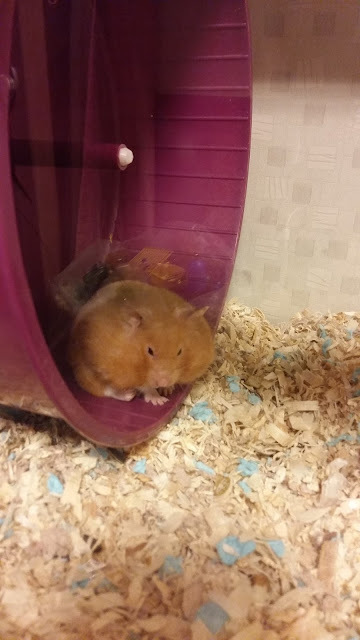 One lovely night while checking on the hamsters, I found Bunny fast asleep on her wheel. This is pretty much the position I found her in, only her eyes were closed. Yup, both of her pouches are stuffed to the brim. Can you say so freaking cute?! You know how things seem so bad while you're going through it, and then you get to the other side and it seems like a silly issue? Or at the very least like a ginormous weight has been lifted off your shoulders? That's how I feel right now. I know G wasn't as bad as I thought he was while we were watching him, but the bad things did overshadow a lot of the good and created a pit of anxiety and worry that I could not shake while he was in the house. Would I do it again? Probably not. Did I learn a lot about myself? Most definitely. I could write an entire novel on what I've learned about myself, both bad and good. All I can hope right now is that I take this experience and use it to better myself. Poor G! He must have felt so out of sorts. That was very kind of you to care for him despite the issues that came up. I have a feeling you won't be eager to sit for G again, but maybe the next time his owners travel they can have someone house sit so G can be more comfortable in his own environment. My brother just house sat and cared for some dogs and chickens and everyone got along swimmingly. I had my mom-in-law's cat this week and in fact she was just picked up today and I was so sad to see her go. She's a super sweet cat and she was a little wary on the first day, sniffing and exploring everything with wide eyes. That first night she yowled a little and would paw under closed doors and she was super cuddly/needy and slept with us. By the 2nd day she adjusted really well and acted like she owned the house. She was so fun to play and cuddle with. All animals are different so it may help G to stay in his own home in the future. 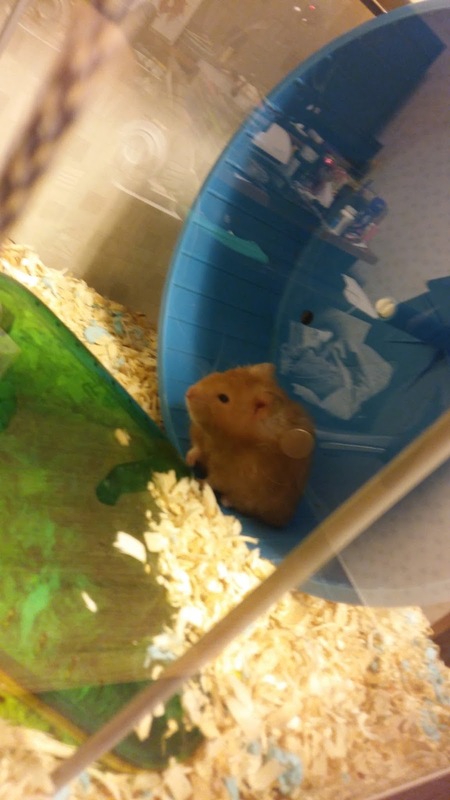 When I first started reading this post I was confused by the pictures of hamsters and I thought G was a rodent roaming your house, lol! G really was a good dog, he just had some maaaajor separation anxiety that we got to deal with. From what his owners have told me when I checked up on them, he's gone back to his normal behavior so they don't think he had a UTI. We did watch him at the end of a long string of others watching him so he could very well have been sick of jumping from house to house. His owners say he's normally very good with others, other pets, and being in a different home. Wow. What a crazy situation. Each animal definitely has their won personality, right? Sounds like he felt abandoned. And the extensions would have certainly made me a little crazy on the heels of an already stressful situation. I am so sorry, Liz. Are you feeling better? Back to normal routines? This last picture should be made into a poster guaranteed to bring joy! What a little chunker!! LOVE it! I'm feeling totally better now! One of my friends who was there in the worst moments of G's stay saw me two days after he was picked up and commented on how much happier I looked. Bunny's picture is now my phone background. In a super scientific study I have concluded that moods are 10000% improved when you see this picture frequently.